This article is posted as part of PGAA’s curation efforts and was provided to Pet Guardian Angels of America by the author, Scott Smith. Pit Bull, Bentley of My Pit Bull Friend. Bentley will be featured later in the story. We have a very special feature today about Pit Bulls, one of the most special dog breeds of all, and yet so misunderstood. I am a human dad to 6 dogs, one being a Pit Bull. It’s a great privilege to introduce you to both Pit Bulls from rescue organizations and to actual Pit Bull owners from all over the country. There are far too many misunderstandings about this magnificent, angelic breed. When I think about what the dog fighting industry does to these soulful creatures, it breaks my heart. If that were not enough, the perception about Pit Bulls in general is so offbase. I always knew that, but now having a Pit Bull, I can say it confidently, based on my own experience. Pit Bulls are extremely strong, that’s true. But that’s not a crime. That doesn’t mitigate how sweet and lovable they are. We don’t hold it against people for being too strong, right? With that said, as with any breed, people should not just walk up to strange dogs without clearing it with their humans first. That’s not a Pit Bull issue, that’s just using common sense. 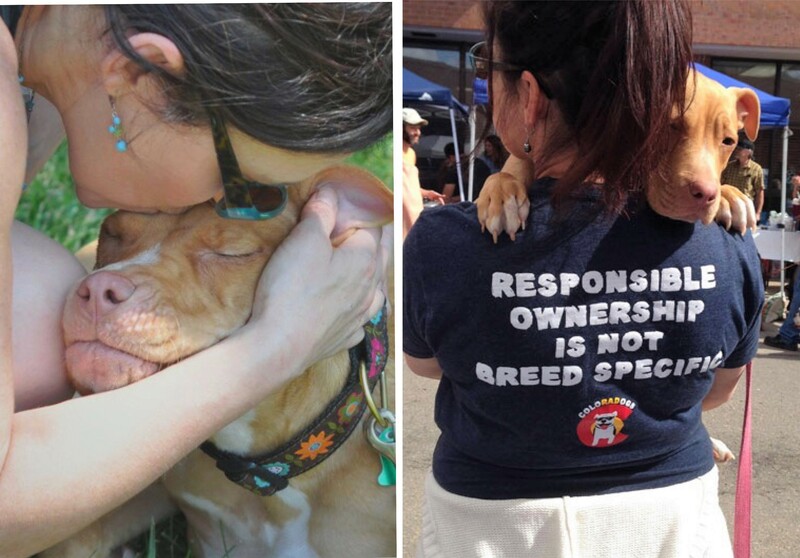 All breeds are a reflection of how they’re treated, just like people. If I were kept hungry and forced to run endlessly on a treadmill like a fighting dog, I would imagine I would be very hostile and aggressive too. Who wouldn’t be? One common theme throughout this story is that Pit Bulls are so grateful despite the horrors of their past. Once rescued and loved, their resentment seems to just dissipate. Boy, people could learn a thing or two from Pit Bulls, that’s for sure. I figured the best way to eradicate all the smoke and mirrors about Pit Bulls was to get out there and speak to rescue organizations that work with Pit Bulls and Pit Bull owners alike. Nobody knows better than the people on the front lines for Pit Bulls every day. None of us in this story are trying to sound fancy and smart. We’re speaking straight from the heart. 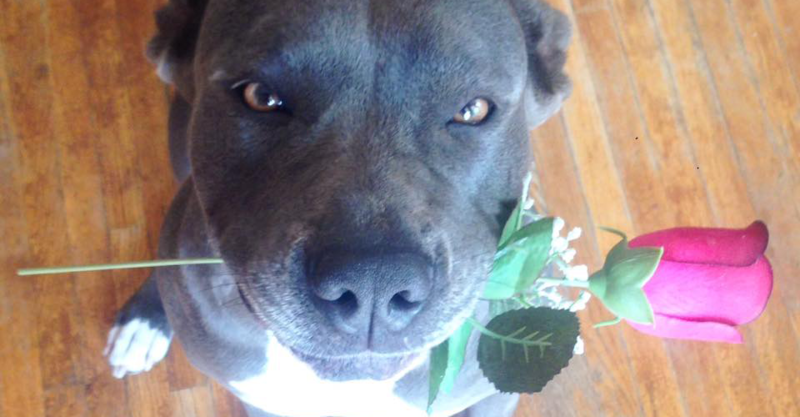 And when it comes to Pit Bulls, it’s all heart. Below are the stories of some featured Pit Bulls that gave our lives a higher sense of purpose. Folks, these are some of the most moving stories I’ve ever heard. My Pit Bull Rocky and I will share our story towards the end. And at the very end, there’s a video of a Pit Bull who’s inseparable from his best friend, a cat. The Dodo was gracious enough to let us include their larger than life video in our feature story. Each story is independent of each other, but they are all miracles unto themselves. Get ready to laugh, smile and cry all at the same time. By the end, you’re going to be able to see Pit Bulls for what they truly are—angels walking among us. To the left, John Garcia and Pit Bull friend, Georgia. To the right, Pit Bull, Karma and cat, Omar. This is John García of Best Friends Animal Society and his Pit Bull friend, Georgia. John has had pitties his whole life. He grew up in Fredonia, Arizona, a tiny town across the border from Kanab, Utah, where Best Friends Animal Society’s sanctuary is located. The sanctuary is the largest no-kill refuge for companion animals in the country. When Best Friends Animals Society had the show “DogTown” on the National Geographic Channel, which took place at the animal sanctuary, John García was undoubtedly the most popular regular. At the time he was managing the dog care area at Best Friends Animal Sanctuary. Now he’s the Emergency Response Manager. “I just thought Pit Bulls were dogs for hyperactive boys like me. I had no idea they had a bad reputation until I came to work for Best Friends Animals Society when I was 18 years old. It was then that I learned what was going on in the animal rescue world and how Pit Bulls were victims of dog fighting, dying in shelters, and seen by people as vicious. I had been volunteering at Best Friends for two years prior to getting hired full time in 1999. Once I turned 18, I was allowed to work at Dogtown where I was aiming from the very beginning. 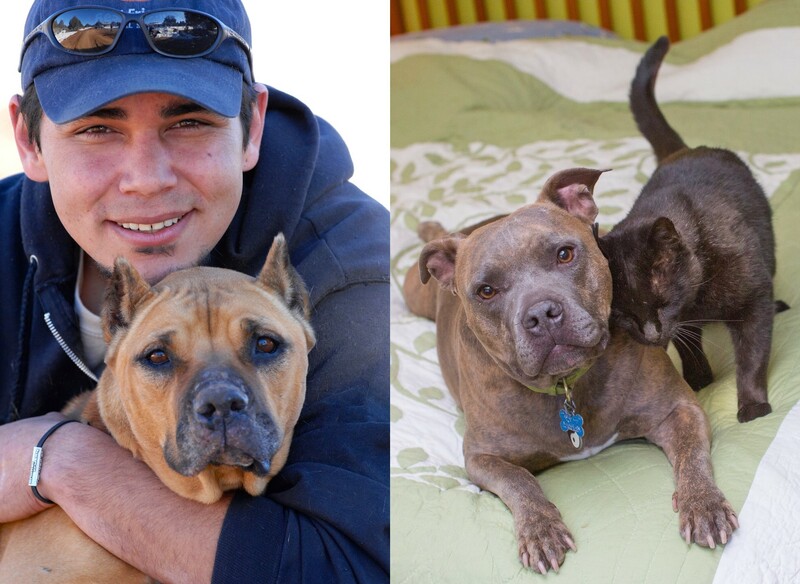 The dogs rescued from Michael Vick’s dog fighting ring were the game changers. 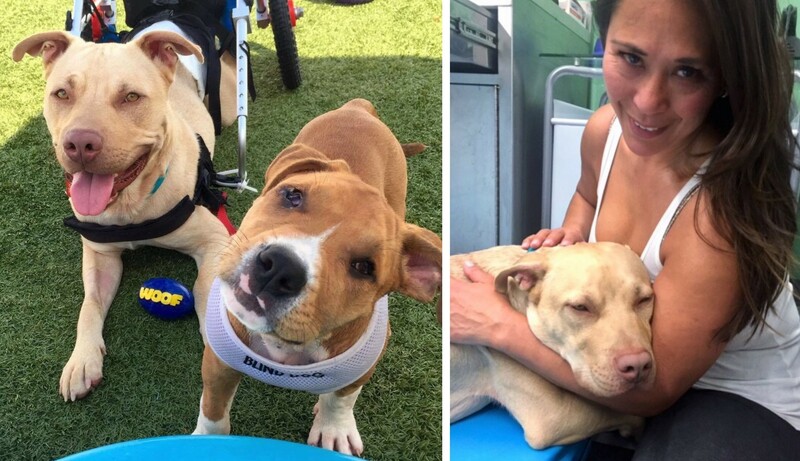 It was the first time the courts allowed these dogs to live and have a chance at rehabilitation. There were 22 of these dogs who came here to Best Friends, we called them the “Vicktory Dogs.” And all of these dogs, whether they went to other rescue groups or came to Best Friends, have literally changed how these dogs are seen. Georgia was one of our Vicktory Dogs and I was told when I first met her that she was aloof and uninterested in people. But once we made eye contact, it was love at first sight. We went on the Ellen DeGeneres Show, and on Larry King Live and I really feel she helped save a lot of other dogs’ lives by showing people that Pit Bulls are dogs and not monsters. I personally feel that Georgia saved a lot of other dogs’ lives and she made me even more of an advocate for Pit Bulls than I already was. “Hero came from the Derek Jensen dog fighting raid in Vermont. Hero spent 6 1/2 yrs on a chain in deplorable conditions. He was in such bad shape that when Out of the Pits Rescue initially rescued him, it was 3 months before he could be vaccinated. He survived Mersa, foreign body surgery, and was then with us a year without anybody filling out an application for him. I lost a dog to old age and decided to take Hero home with me. Within 3 months he passed his CGC (Canine Good Citizen test), CGCA (the advanced, CGC), TT (Temperament Test), TDI (Therapy Dogs International) and was visiting as a therapy dog. American Kennel is a great resource for information regarding certificates. Pit Bull, Blossom, in both pictures. Next up, Katherine Bozymowski of, North Shore Animal League America, speaking about her Pit Bull, Blossom. 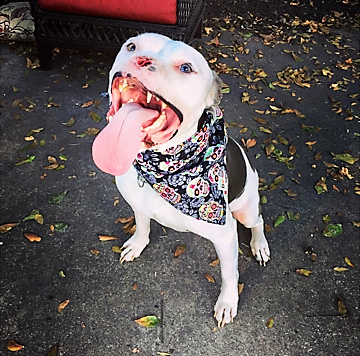 “If my husband and I could rename our pit bull, Blossom, there’s no question we’d change her name to Loyal,” because that’s the best way to describe her. Blossom, now 2 years old, is a rescue from North Shore Animal League America. At just four months old, she was found roaming the streets completely emaciated and suffering from a painful skin disease called demodectic mange. After receiving extensive medical care at our Alex Lewyt Veterinary Medical Center, and enrolling in our wonderful Foster Care Program, she was completely healed and ready to be adopted. My husband and I had the chance to meet Blossom before she hit the adoption floor, so when that day finally came, we didn’t waste any time making it official. Once we brought her home, Blossom settled in quite nicely. She immediately bonded with her doggy sister, Stella, an American Pit Bull Terrier/Hound mix, who we’d also adopted from Animal League America. As Blossom helped Stella come out of her timid shell, the two of them became inseparable. Although I always knew she was one of a kind since the day we rescued her, the day I truly saw how special Blossom is was when she rescued me. I was 20 weeks pregnant, alone in my home one morning, going about my usual routine. Without warning, I fainted. All I remember is being woken up by Blossom licking my face, while Stella, obviously shaken up, hid in fright. What if she hadn’t been there? What if I hadn’t woken up? After I came to, she followed me to my bedroom and laid next to me until I calmed down and called for help. Blossom saved my life and my unborn child’s life that morning. As the producer of this feature I want to jump in here for a moment. Katherine’s story is a perfect depiction of where the phrase, “Who rescued who?”, came from. Both pictures are of Pit Bull, Malibu. Photo credit; Laura of lartephotography.com. Christine Smith talks about her Pit Bull, Malibu. You can find Malibu on Instagram. 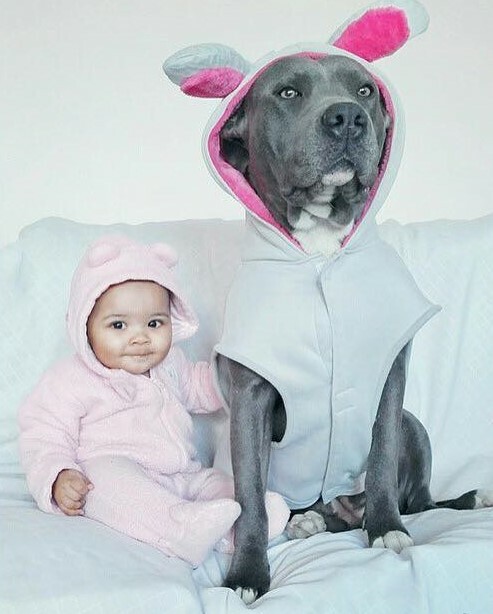 “As a pit bull owner, we face breed discrimination on a daily basis. We also know the truth about them. They are the most loving dogs you can imagine. Pit Bulls are intelligent, loyal, goofy, athletic, and eager to please. They love people, cuddling, adventuring, and just being near their humans. In the early part of the 1900’s, the Pit Bull Dog was commonly known as the ‘Nanny Dog’. Some will remember growing up with one in their living rooms if they watched ‘The Little Rascals’. 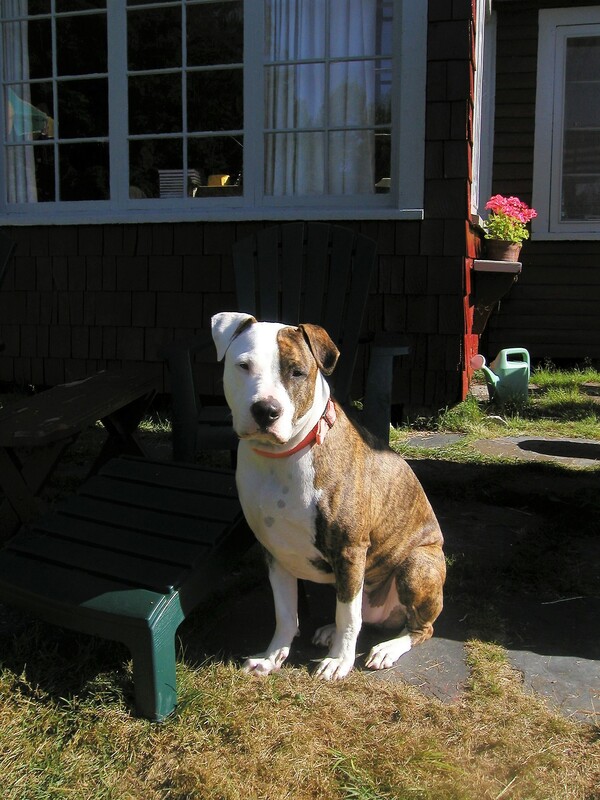 Yes, Petey was an American Pit Bull Terrier. Unfortunately, over time people chose to abuse and neglect these wonderful dogs, using them for fighting, which has victimized this wonderful breed of dog. Adopting Malibu has brought endless amounts of joy to our family. She is forgiving of the mistreatment from her past, like so many other dogs that end up in the shelter system. She provides laughter, a smile that brightens every day, stress relief, and is a partner to explore with. She has taught us responsibility, patience, selflessness, and the commitment that comes with having a dog. She recently played a big part in helping her Dad to heal following a heart attack and open heart surgery. She provided him emotional comedy relief with her silly antics. “I first heard of Potter through a mutual rescue person who volunteers at a local open door shelter. She told me of this young dog (he had adult teeth, probably about six months old), that someone had left tied out in their parking lot. She said he appeared to have whip lines across his body, a broken tail and other injuries. She told me he would scream when anyone tried to touch him. I agreed to take him sight unseen. By the time I got him out of the shelter two days later, it was apparent he had acid dripped on his back as it had continued to eat at his flesh. When I got him, his wound was approx two inches in width and ran the length of his back. I personally fostered him and cared for him. I would do water therapy twice a day, as well as debride the wound. In short, not only did he heal-although he does have a scar that runs down his back-he is also one of the funniest, most engaging, happiest dogs I’ve ever known. On the left is Eddie Milo and a blind puppy, Opie, in the white collar. On the right, Eddie Milo and Regina Mendoza, CAMP SCR director. Pit Bull, Eddie Milo, comes to us from Second Chance Rescue NYC. “We saw a photo of Eddie Milo sitting in a kennel in a high-kill shelter unable to move from the waist down. From that moment we fell in love with him and knew that we wanted to give him a second chance at life. Looking at him, we saw an angelic and enchanting spirit. We made a commitment to take him on, and we’ve never looked back. He was left untreated for almost a month with damaged vertebrae, compressed discs, nerve damage and several BB’s in his back. As a result, he had little to no mobility in his back legs and cannot walk. Before arriving at the shelter, he was found by a woman as a stray and became her therapy dog. The woman was suicidal, as she suffered from depression and anxiety. Eddie Milo intuitively knew when she needed him and he would spend the day with her inside when she was feeling down. Unfortunately Eddie Milo was surrendered to a high-kill shelter by the woman and her family when he was found injured—his rear legs became paralyzed after he went off on an excursion. Perhaps he was hit by a car or fell off of something. She was on a very low income and could not afford his medical care. Today Eddie Milo lives at our private boarding home called, CAMP SCR with our amazing camp director, Regina Mendoza. Eddie befriended a blind puppy named Opie, that he cares for and helped come out of his shell when he was afraid. Opie has since been adopted, but it’s yet another testament to how loving Eddie Milo is. He goes to weekly water therapy at Water4dogs and has made vast improvements in his mobility. He is currently in a wheelchair, but we have not given up hope that perhaps one day he will be able to walk again. He has already shown signs of this by standing for prolonged periods of time. Eddie Milo has a huge following of fans that he continues to inspire. He just doesn’t give up. To us that is worth the world.” — Donations for Eddie Milo’s therapy would be greatly appreciated. Again, Second Chance Rescue still hopes Eddie Milo will walk again. Now, Pit Bull, Bentley. This angel comes to us from, Laura, of My Pit Bull Friend. “Pearl spent the first nine years of her life living in a backyard giving birth to countless puppies sold for profit. She survived many bitter cold winters and hot humid summers alone outside, but finally escaped and was taken in by a kind, dog-loving couple in a nearby neighborhood. 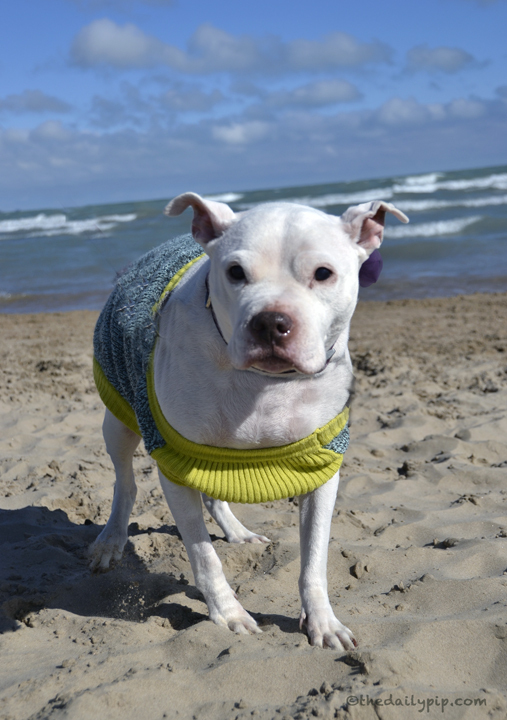 I met Pearl at the Montrose Dog Beach on a cold Chicago morning. She was bundled up in a sweater with a purple flower around her neck. Clearly loved and adored, she harbored no resentment and had completely forgiven the cruelty of her past. She moved very slowly, but with determination, and seemed to savor every new smell and approached each new person and dog with delight. Although suffering from mammary cancer and other illnesses, she truly embraced and lived in the moment. I only met Pearl briefly, but her beautiful, unbreakable spirit made a lasting impression on me. 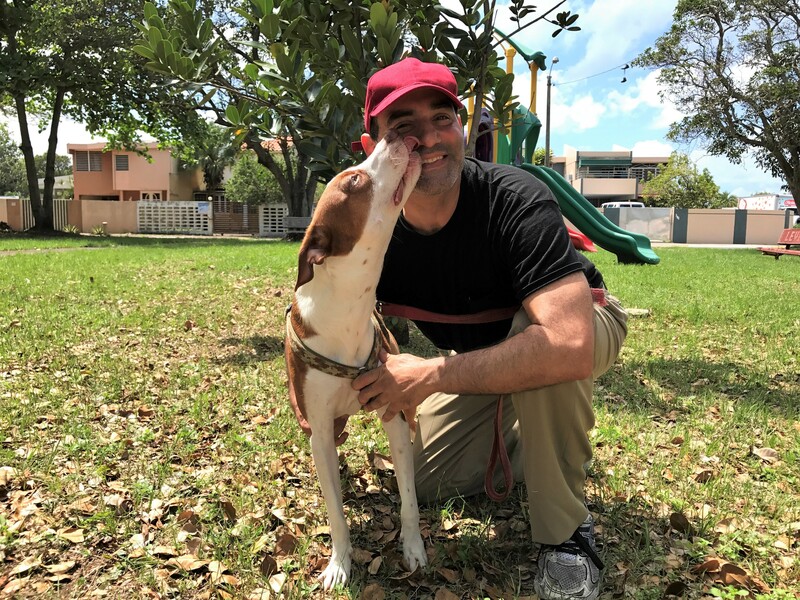 I have met hundreds of rescue dogs, but there was something special about Pearl – her gentle and forgiving heart, a shining example of all that is possible through compassion and the power of second chances. We offer human mom, Mariah, our condolences. Pearl’s gone, but will never be forgotten. 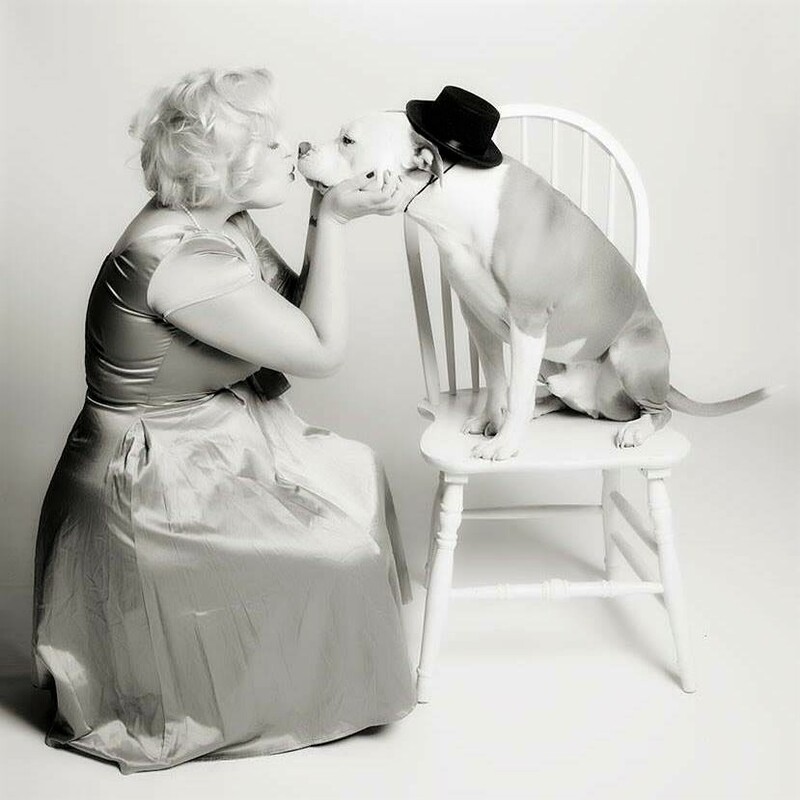 On the right, Pit Bull Piper and her human mom Alison, credited to Rachel Johnson. The picture on the left is credited to Emily Tronetti from Heal to Howl. The next Pit Bull comes to us from Alison Reder of the Sarcastic Dog. “There is a saying, ‘Dogs have a way of finding the people who need them and filling a space we didn’t even know we had.’ When I started my blog, Sarcastic Dog, it was really just going to be a place to talk about the crazy antics of my two yellow labs. Then, when my daughter went off to college, I started volunteering for a local pit bull rescue and advocacy group and my whole world changed. I decided to give fostering a try. My first foster was only with me for two weeks before finding her perfect forever home. My second foster puppy, Piper, arrived under the weather and ended up being with me for much longer than she might have had she been totally healthy. As a result, our bond was really strong and, even though my friends and family knew long before I did, I ultimately realized Piper wasn’t going anywhere. Among the many pieces that Alison’s written, Changing the Conversation about Pit Bulls: Part 1, is a particularly powerful statement for Pit Bull advocacy. This story on Pit Bull, Saint, comes to us from, BadRap.org. Chris is homeless and came to one of our Owner Support events for vaccines, but agreed to have Saint, his Pit Bull, neutered as we got to know each other. It was a tough sell-he really wanted to have one of Saint’s puppies, in part because his entire human family had died and he’s basically alone-and Saint is becoming a senior-. I’m not sure where he first found Saint, but this dog is clearly keeping him focused on staying alive. 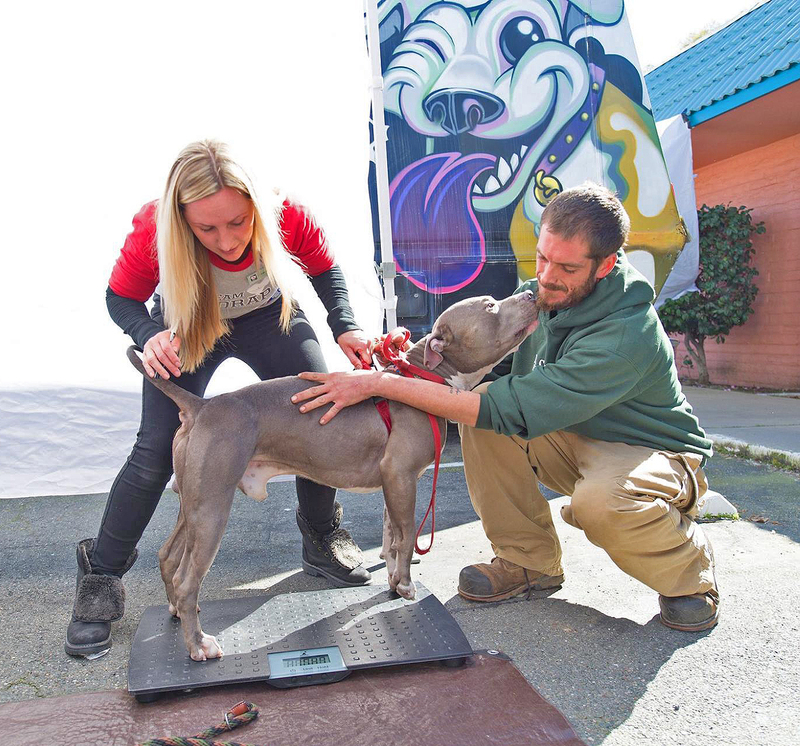 BadRap.org says, “In CA, it’s less about wanting people to “like” pit bulls, and more about working out ways to keep them stay safe in their homes and out of the shelters. Speaking of breed discrimination, animal advocate organization OKi Doggy, has a lot to say about that. Their mission is to promote animal welfare through different kinds of campaigns. They’re dedicated to raising funds to promote adoptions and education, as well as to foster awareness about animal cruelty and breed discrimination. As part of their initiatives, they’ve developed a clothing line called WEAR L.O.V.E. (Loving Owners Versus Euthanasia), and tailored campaigns like “The Cruelty Survivor”, created to bring awareness about animal abuse and neglect. Apollo, the pit bull in the picture above, is part of that campaign. Oki Doggy’s Team Malibu has a Pitbull, Malibu, “the bandana girl” as its brand ambassador. When it comes to giving back and bringing resources to the animal rescue world, Oki Doggy has a strong and a clear message. Make sure to visit their website okidoggy.com and unleash the power of giving. Full story on Apollo by the Dodo. This is Presley. She has passed by now. But her human mom, Jane Hoffman, of Mayor’s Alliance for NYC’s Animals, reflects. “We adopted Presley from Animal Care & Control of NYC (today known as Animal Care Centers of NYC) when she was 2 years old. Wilbur went from owner surrender to ambassador for dogs like him. He’s now a Canine Good Citizen and travels the country with Shannon breaking stereotypes. Pit Bull, Wilbur, and human mom, Shannon, comes to us from My Pit Bull is Family. Originally, Shannon was just going to foster him. Shannon explained that she foster failed with him. Now failing in that sense is actually positive. Transation, after a few days of fostering him, Shannon decided to make it permanent. That was 4 blissful years ago. Shannon and Wilbur are peas and carrots. Shannon and Wibur (yes, Wilbur) are the Executive Directors of mypitbullisfamily.org, and we’re home of the largest housing database that does not breed discriminate. Wilbur did receive his “Canine Good Citizen” certificate from American Kennel Club. — The AKC’s Canine Good Citizen program is recognized as the gold standard for dog behavior. Finally, this is me, Scott Smith, with my Pit Bull, Rocky. As I mentioned at the beginning of the article, my wife and I have 6 dogs. We have a Schnauzer, Pomeranian, Maltese, Havanese, a mixed breed, and now a Pit Bull. I rescued Rocky on November 19th, 2015, exactly 496 days ago. It was a Thursday and I was walking three of my five dogs. Out of nowhere, a large but very skinny Pit Bull just walked up to us and sat right down. When we started walking again, he would walk with us. When we stopped, he stopped. I was getting a little concerned, to be honest. After thinking it through, I was realized that if he was going to attack, he would’ve done so already. I realized that this dog was hungry and needed help. He was frail and infested with large ticks. I could tell he was very young from his teeth. It broke my heart seeing this boy in such a condition. He was lost and had no clue what to do. And when I say lost, I don’t mean directionally, I mean functionally. I just could not abandon him, in good conscience. I took my three little dogs back to the house and returned to the park with some food. I sat with him while figuring out what my next move was going to be. I first brought the stray to a local vet that also offered boarding services. I told the vet to help him with his ticks and to give him a checkup. I kept him there for five nights, while trying to find him a new home, but to no avail. There were no takers. So I picked up him at the vet and brought him home. Now, 496 days later, Rocky is as healthy and strong as a horse. He’s an integral part of our family. I love him to death. I call him “My Little Big Guy.” He’s little in the sense that he’s just over two years, and he’s big in the sense that he’s incredibly strong. Seeing his progress from that random Thursday in 2015 has mended my heart from how broken it was that day. I love him, and that’s forever. And now I love Pit Bulls, and that’s forever too. Very heartwaring video by of a Pit Bull and his best friend, a cat. Video credit; The Dodo. Thanks: I’d like to take this space to appreciate all the wonderful people who participated in this story, and daily give of their time and efforts to work for Pit Bull advocacy and animal rights. Stories like these help challenge the many misperceptions surrounding this breed, and hopefully, change the public’s mind. 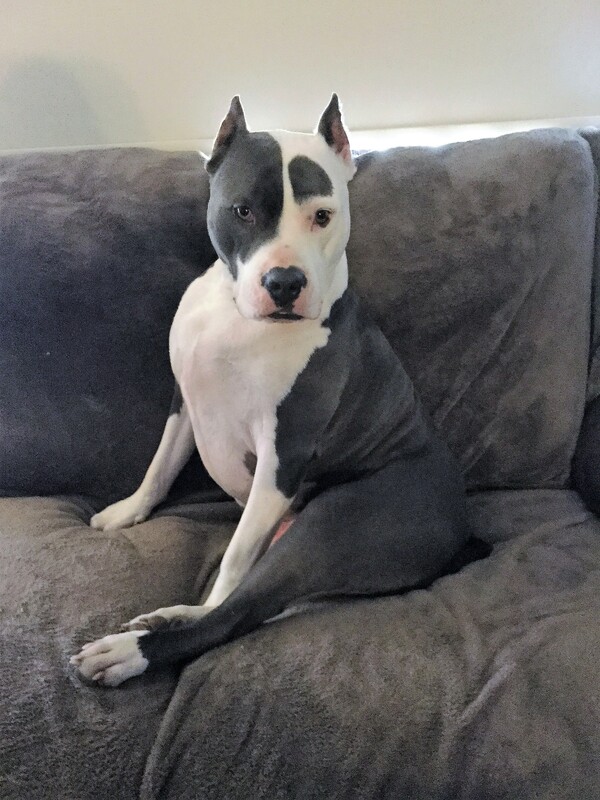 Special appreciation to Jane, Regina Mendoza, Debbie Wilke, Christine Smith, Katherine, Kathleen Lynn, Cydney, and John García, for taking the time to write down their heartwarming Pit Bull testimonials. -these stories couldn’t exist without you. Sincerely, Scott Smith — Community and Pet Editor for Consumers Advocate. I also run the “Everybody Loves Sammy” online community.